Ojen Malaga information. Getting from Malaga airport to Ojen. 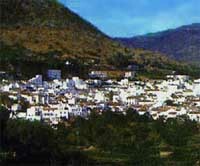 This municipality in the province of Malaga is situated 8 kilometres to the north of Marbella and to the west of Mijas. Located between Sierra Blanca and Sierra Alpujata, this white village of Malaga hosts the typical white houses and Arab-style narrow streets. The mountains of Ojen have a wide variety of fauna and flora, where we can highlight the presence of the Hispanic mountain goat and the Golden Eagle. Human presence has been found since the Middle Palaeolithic although the first settlement dates back to the Neolithic. During the Roman Empire it is thought that there was a village although there is no evidence found yet. The very first information that exists of Ojen’s existence dates back to the Moorish rebellion carried out all around the territories occupied by the Christians in Al-Andalus, this rebellion is believed to have been carried out due to the religious persecution suffered by the Arabs and the Jews; one of the battles took place in front of the castle of Ojen around the year 1569, who escaped after assassinating their Christian neighbours and setting the religious buildings, houses and cultivations on fire. Only a year later the confrontation ended and Ojen was repopulated with Christians brought down from the north of Spain and surrounding villages. Back then, the Muslims were forbidden to settle near the coasts, due to the fear that they could help the Turkish pirates that besieged the south of Spain. In the end they were expelled or enslaved in the year 1609 by the King Felipe the 3rd. In 1906, the Palace of Juanar was built, where in one occasion the King Alfonso the 13th was invited. Today it’s currently a National Parador (a state-owned hotel). Ojen was known as a simple and peaceful village over the past years until our days. The famous ‘Aguardiente’ (brandy/liquor) of Ojen, a type of sweet liquor that has been produced since 1830. It was one of the area’s main demands, although the factory shut down in 1920 due to a plague that killed the vines in Malaga. We specially recommend a wander around Ojen’s old quarter, with its Moorish style and layout narrow streets and its viewpoints. The Incarnation church was built in the 16th century upon an old mosque. La Fuente de los Chorros (the fountain of the squirts) was built recently, but shows the abundance of water in the area and can be considered of Ojen’s symbols. The Oil Mill Museum, which is currently fully and perfectly restored, exhibits the original machinery of the mill and is occasionally used as an exhibition hall. Head towards Marbella along the A-7 highway where you’ll come across a well signposted turnoff that will take you directly to Ojen. If you prefer to drive your own vehicle, at Malagacar.com we offer you low prices for Malaga car hire, plus you can also include a GPS as an extra that will guide you along the route. Another transportation option is to book a Malaga airport transfer to Ojén. Follow the link to check our prices. You can also choose a Malaga airport transfer to Ojen, for a quick and comfortable transfer without having to hire a car. On the map below you can see the marked route to get to Ojen from Malaga airport by car. Town council: C/ Carreras, 5 - 29610. Official website: Ayuntamiento de Ojen.